It's not too late to book your journey. This is unique opportunity to gather together in one of the most beautiful locations in Egypt for an inspirational week of yoga, music, and fun. The Egypt International Yoga Festival has invited a host of world class teachers. I will be teaching Kundalini Yoga at the festival. Choose from a variety of yoga classes and different workshop experiences. 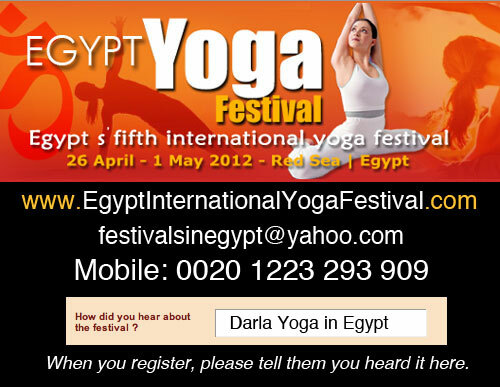 When you register, please let them know you heard about the festival from Darla Yoga in Egypt. Maybe you're wondering "IS it SAFE to visit Egypt now?" Reason 1. Prices are very good. Reason 2. Tourism is noticeably down, so the touristic sites are refreshingly peaceful. Fewer crowds opens more opportunities for you to see the full splendor of beautiful temples and sites. Reason 3. Egyptians are helpful and hospitable. English is a common language. You'll be fine. Reason 4. Sharm el-Sheikh has some of the most beautiful resorts and beaches in Egypt. It is also a favorite spot for scuba and snorkeling. Reason 5. If you plan to fly into Cairo, or visit Cairo, consider it no more dangerous than any other large city. In reality, it is safer than most large cities. Reason 6. Protests and demonstrations are limited to a small area in Cairo: Tahrir Square. Most of the time, this busy traffic area is open and bustling. When there are protest gatherings in the square, you avoid the area. Enough said. Reason 7. April is a ideal weather time. Temperatures will be warming up as we move into summer, but it will be quintessential touring weather. Reason 8. We have so many amazing ancient monuments and sites to see. Egypt is one of the three oldest civilizations in the world. It is the seat of the Arab Spring. What you will find is a trip of a lifetime. Reason 9. We have the Great Pyramids and they are awesome! Reason 10. You will receive the most TRUE spiritual lessons here, unlike any place in the world, such as: "People are more alike than different" ; "surrender" ; "go with the flow and hold no expectations" ; "be present" ; "God's Will, not my own." --- This I know. I hope to see you at the Festival! Please feel free to contact me if you have any questions. These are airfare estimates from the states to Sharm el-Sheikh. The Egypt Fifth International Yoga Festival will be held 26 April 2012 – 01 May 2012. We are excited to present this fifth international yoga festival, and we think it will surpass all the others from our successful past. It will be held at the Domina Coral group of hotels at the beach at Sharm el-Sheikh, Red Sea. Our theme this year is ‘Egypt Back to Freedom’, which is the highest goal of yoga, freedom – Kaivalya – and also for the freedom of the people of Egypt, following their successful revolution in February 2011. It is time of new beginnings, new opportunities for prosperity and growth. We invite you to participate in this renaissance of human culture, enlightenment, and prosperity. Come and join us! Come alone and meet new friends! Come with friends, students, family... Sign up now for Egypt Yoga Festival 2012! Follow Mrs. Cairo Yogini's board My Yogic Life on Pinterest. 4. There’s a way through every block. All photos and text are by Darla Hueske, unless otherwise stated. Awesome Inc. theme. Powered by Blogger.